Disclosure: I received promotional items from LifeLock, Inc. to facilitate this review; all opinions expressed are my own. The day before I gave birth to Gray I attended LifeLock's luncheon at the famed Tavern on the Green. I literally went into labor on the way home! I learned during the session which included finance expert, Jean Chatzky, that new parents are 5x more likely than the average population to experience identify theft. When they shared the information about new homeowners and identity theft I wasn't as alert since we weren't planning on home-owning soon, but they informed us here in NYC-metro it can apply to renters too. 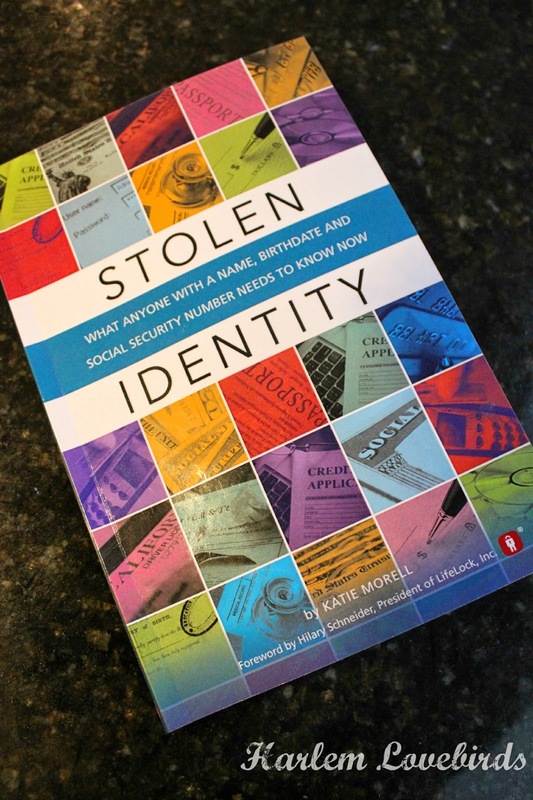 At the time I had no idea that we'd be moving this fall but now that we are I've picked up the book Stolen Identity which we received at the event to refresh on a few pointers shared during the discussion. Only 138 pages and full of anecdotes, it's a very easy read. Published by LifeLock but written by an independent journalist, Katie Morell, I really appreciated that the book wasn't a hard sell for LifeLock and had clear checklists at the end of each section to help the reader avoid identity theft. Thinking back on my own experience while I've never had outright identity theft I did have my Pinterest account hacked earlier this year (first world problems I know! ), but it was definitely an eery feeling as the person then started generating content and changed my settings so it was cross-posting to Twitter. Mr. Lovebird on the other hand did have a bigger and bizarre breach a few years ago when someone purchased hundreds of dollars worth of Burger King in one fell swoop using his credit card. While we never found out who the culprit was his company was quick to clean up the charges and issue a new card. Prior to that I remember an incident in college when someone asked to borrow my ID to get into a party. There was no way I was going to hand over my ID, but now the thought of what could've gone wrong even then makes me shudder. Throughout the book there are also mentions of what the government is doing to help consumers combat identity theft. Since the book was published just this summer it's very update on legislature, and I have to say I'm quite disappointed at some of the bills that have gone flat. Big business vs. ID theft is a tough balance apparently. Stolen Identity also makes it clear that the rest of the world is way ahead of the U.S. when it comes to implementing technology to protect its citizens. Just like smartphones, it's going to take a while before we're up to speed. Even with fingerprint technology there are still even workarounds that have been developed to hack it. Nothing is fail proof! For those who have had their identity stolen in really bad cases it pretty much becomes a full time, and sometimes costly, job cleaning it up. I think it's better to be as preventative as possible and helping consumers with this is LifeLock. They've generously offered one of my readers a 6 month membership. Offering five points of protection from credit monitoring to scanning for identity threats, this is especially handy as we head into the holidays and online purchases increase. To enter this giveaway simply use the Rafflecopter below. It's a flash giveaway running today, September 12 - Sunday, September 14 midnight with the winner announced on Monday, September 15. Open to U.S. residents only. Have you or someone you know had your identity stolen? How do you protect yourself?